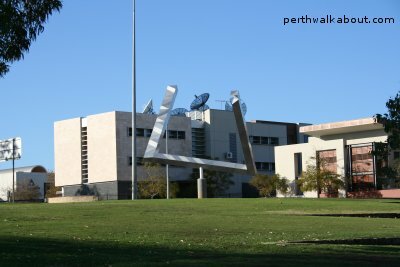 Walking along The Greenway pedestrian path, you will be able to spot the "Impossible Triangle" sculpture at the roundabout of Bennett Street and Plain Street in East Perth. 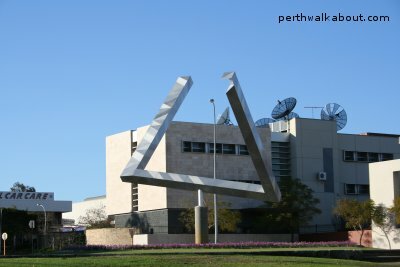 The Impossible Triangle sculpture forms part of Claisebrook Square and had its beginnings when local artists were invited to submit their ideas for a major public artwork commission as part of the East Perth Redevelopment project. The Impossible Triangle sculpture was created by local artist Brian McKay and architect Ahmad Abas and is based on the "Penrose Triangle" concept developed by the British Geneticist Lionel Penrose and his son Sir Roger Penrose, a Professor of Mathematics in the 1950's. Is the Impossible Triangle an Illusion? The illusion of a triangle occurs when the sculpture is viewed along the privileged axis at only two locations. Check out the sequence of photos below on this page and the next page to see how the Impossible Triangle comes together or does it?